The name’s Cold – Bloody Cold. 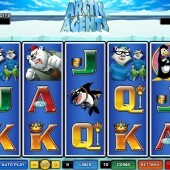 Seamlessly merging the world of penguins with secret agents (Hollywood, you’re missing a trick) slot developer Microgaming put away their obsession with superheroes for five minutes and delve into icy water with this 5 reel, 9 pay-line slot. 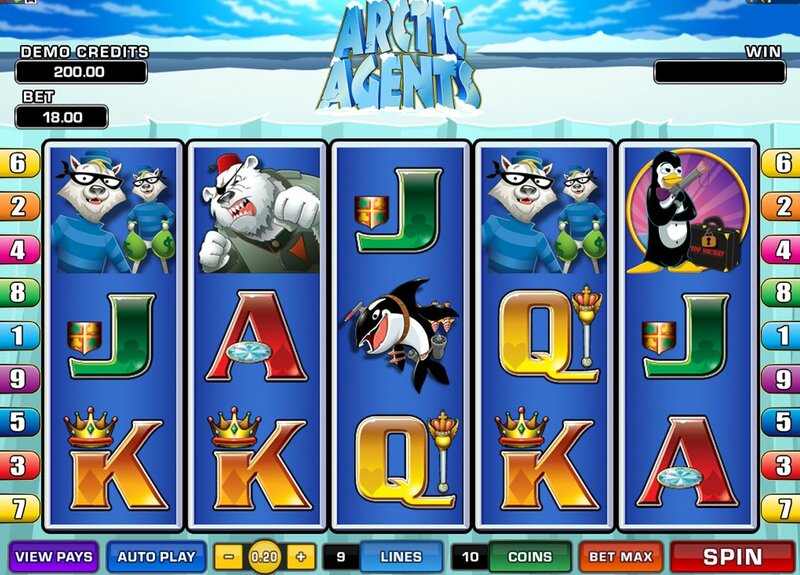 Arctic Agents is bright, breezy – or should that be freezing – and accommodating, with low betting limits on offer and plenty of silly action. Taking the tux out of James Bond and giving it to a penguin was a stroke of genius, and it’s the arctic agent hero you’ll be rooting for in this game. The penguin is the game’s Wild, and he substitutes for all regular symbols, including the penguin’s female sidekick, the shark, the evil polar bear Dr. No-alike, a pair of snow wolf thieves, and some iceberg hideouts. Wild wins are doubled, but during the bonus game free spins the Wild wins are multiplied by twice whatever the multiplier is set to. The Wild doesn’t substitute for the Iceberg Scatter, and it’s this symbol you should pay close attention to. Three or more Scattered Iceberg icons triggers the free spins round. Randomly you’ll be awarded spins and a multiplier, anything from 3 spins with a 15x multiplier to 20 spins and a 2x multiplier attached. My tip is try and go for the middle ground – 10 spins with a 5x multiplier. During the free spins round more Iceberg icons on reels 1 and 5 triggers a random win of 2x-50x your total bet, on top of any bonus round wins. The free spins round may be the game’s only bonus feature, but with plenty of tasty multipliers you can make just one bonus round trigger work in your favor. In essence it’s a bit like Microgaming’s excellent circus-themed Carnival Royale with its neat take on free spins. For more free spins malarkey, check out Ash Gaming’s great magic-themed slot, Harry Trotter, with free spins rounds galore and Expanding Wilds to boot (not to mention three jackpots).